After strong absorption in 18Q4, Atlanta looks to have broken out of a holding pattern in vacancies that it has maintained for nearly three years. Further, new office development this cycle has generally been build to suit, with State Farm, Cox Communications, and NCR leading the way. And even though Atlanta is experiencing the highest level of construction in the current cycle, the net amount of new supply still falls short of Atlanta's historical average. Still, several recently announced projects could send construction levels higher in the near future, with high levels of unsigned space available. 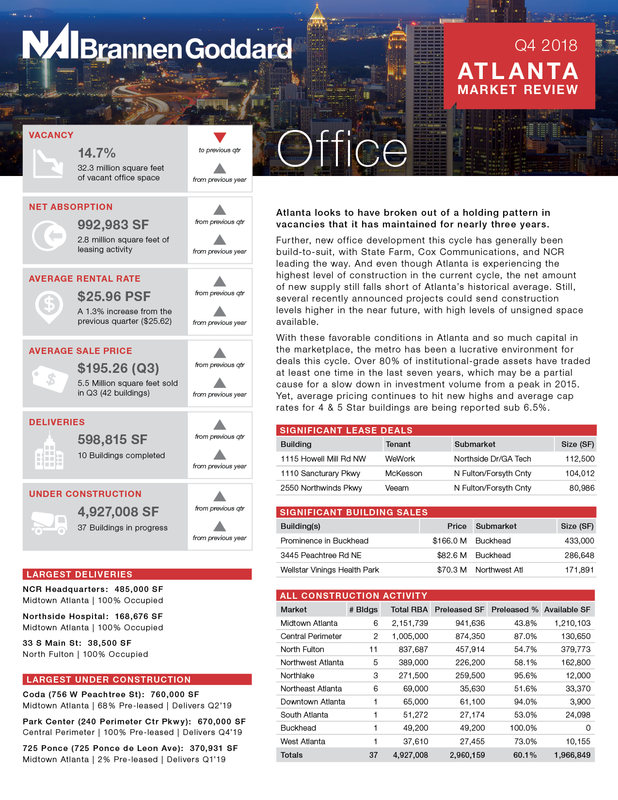 With these favorable conditions in Atlanta, and so much capital in the marketplace, the metro has been a lucrative environment for deals this cycle. Over 80% of institutional-grade assets have traded at least one time in the last seven years, which may be a partial cause for a slow down in investment volume from a peak in 2015. Yet, average pricing continues to hit new highs and average cap rates for 4 & 5 Star buildings are being reported sub 6.5%.